Slow cooker recipes introduced me to the world of chicken tenders. Before I started using the appliance, I never thought about cooking the smaller cuts of chicken breast. I figured it was something that only wing places did. I have found that chicken tenders cook more quickly and are easier to shred. Every time a recipe calls for chicken breast, I go for the tenders. 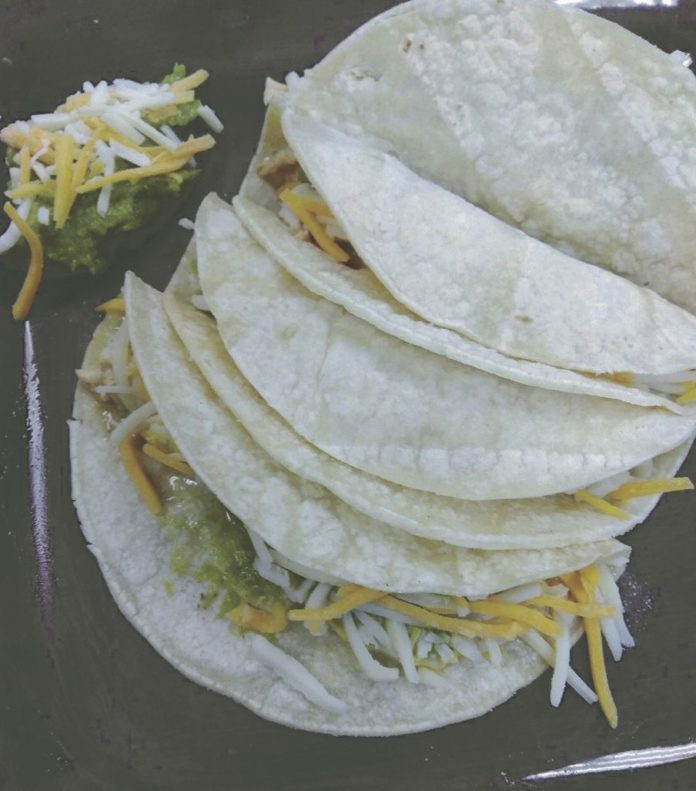 My colleague passed along a recipe for salsa verde honey-lime chicken tacos from alattefood.com. It asked for three chicken breasts. True to form, I ignored that part of the recipe and went with the tenders. This is another recipe in which the slow cooker does all of the work. Again, the reason I bought a Crockpot was because I don’t like spending a lot of time in the kitchen. Place the chicken, honey, lime juice, salsa verde, sour cream and taco seasoning in the slow cooker and let the ingredients cook for three hours on high. Once that is complete, shred the chicken and spoon them in tortillas for an easy taco meal. Your taco toppings can be whatever you like. I’m using guacamole and cheese. You can also toss in tomatoes, jalapeños, onion, cilantro, avocado, etc. >> You can make this recipe healthier by making your own salsa verde. You can control the sodium and the ingredients. >> You can also substitute the sour cream for plain yogurt. >> 2 teaspoons taco seasoning. >> Place chicken in slow cooker with honey, lime juice, sour cream, salsa verde and taco seasoning. >> Cook on high for 3 to 4 hours. >> Shred chicken and then stir it.